I didn't even know there was a gigantic Bear and Tiger zoo in Guilin until I arrived at Guilin when I saw a billboard promotion. Thinking this would be a very interesting place to visit, I worked it into my travel scheduel in my last day at Guilin. Not sure why, but this zoo doesn't seem to get much mention anywhere... Perhaps it's overshadowed by all the great scenic spots around Guilin and Yanghsuo. Or it could be due to liability reasons. Although its safe, it is a zoo filled with tigers, lions, and bears. Who knows? Xiongsen Tiger and Bear Mountain Village front entrance. 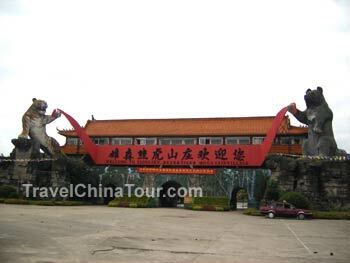 The Xiongsen Bear and Tiger Village is located about 25minutes from the city center just off the Guilin airport expressway. It's located right by the highway ticket booth, where you have to pay the toll to enter the expressway. The zoo sovers 300,000 square meters, and is one of the largest tiger and bear zoos. The zoo boasts to have 1100 tigers, 300 lions, and 300 bears. 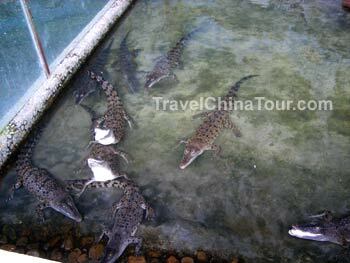 It also has various other types of animals such as monkeys, snakes, crocodiles, and many other speicies. As claimed by the zoo to "maintain the wild nature of the beasts", they hold daily training performances where tigers are unleashed on a cow, but more on that later. I arrived at the Xiongsen zoo after a 25 minute ride from my hotel. Because it's difficult to find a return taxi from the zoo, I just booked a taxi for half a morning for a round trip to and from the zoo, which I bargained down to $90 yuan from the initial $120 yuan asked. The taxi would wait for me while I toured the zoo. Northeastern China tigers (Siberian tiger). 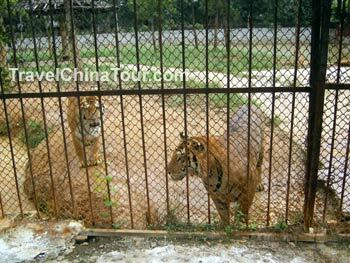 The entrance ticket costs $80 yuan, and once inside, they provide you with a tour guide to show you around the Xiongsen zoo. Althought the zoon advertises to have over 1100 tigers, 300 lions, 300 bears, others tell me its probably more around 400 tigers, 300 lions, and 300 bears. The zoo also has other exotic animals such as alligators, peacocks, ostriches, monkeys, and there are also baby tigers. Curious to see what I'm fishing? Along the way, I came up to the crocodile section of the zoo. There was one section with fully grown crocodiles, and beside it a section with young crocodiles. The zoo keeper allows tourists to feed meat to the young crocs at the cost of $5 yuan per piece. No, there is no hook on the bamboo rod string. 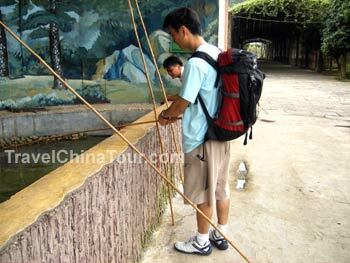 The meat is tied to a string on a long bamboo stick, which you use to feed the crocodiles. They snap quickly at the meat as you lower it. While feeding the young ones, they all stand up with their mouth open, ready to snap at the meat - it was somewhat scary. Additional Notes: I've received emails from readers about animal rights issues at this zoo. So I am posting this additional note here for readers who are concerned about this and feel passionate about animal rights issues. Before deciding to visit this zoo, please do all your research ahead of time.